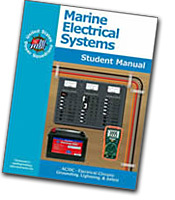 Marine Electrical Systems – is a course dedicated to onboard electrical power – both AC and DC. You will learn about electrical circuits, wiring, terminating, and routing wiring for safety and trouble-free operation. You will learn how to use multimeters and tools to check, diagnose and repair electrical problems. You also will learn about galvanic corrosion, stray currents, isolation, grounding, and safety of electrical systems.